Do you decorate for Fall? I've never liked the thought of decorations that come out once a year for a few weeks then are stored away. I think it's because I've been to too many estate sales where the basement is full of old, dusty Christmas decorations (so sad). Consequently, if I buy something for decoration, I leave it out all year long. and these pumpkins on the mantle. I also like to use natural decorations and about this time of year I cut all the blooms off my hydrangeas to dry in vases. In the winter I love to pick up evergreen boughs for the mantle after a winter storm. 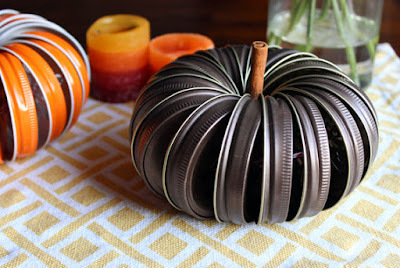 Then I saw this little pumpkin do-it-yourself and thought they'd make great outdoor decorations! They're waterproof and you could replace the cinnamon stick with a plain old stick! This Etsy store sells the colored jar lids but you could easily spray paint some jar lids you may already have! 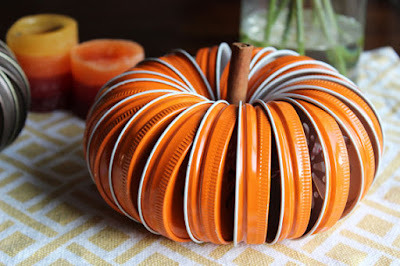 Just punch a hole in the middle of the lids, or use mason jar rings, and string them together shaping them into a circle. Here are better instructions. 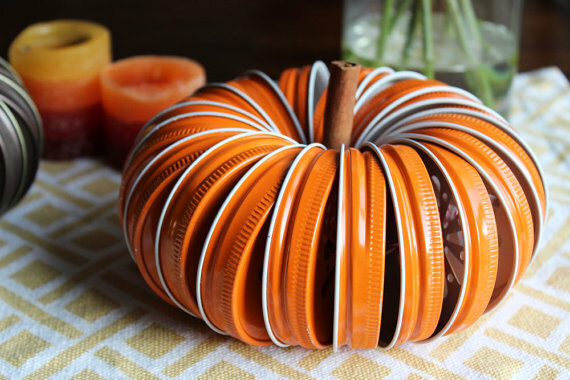 Wouldn't a group of them in a basket on the porch make a fun Fall decoration?